Netvibes - What Is It? If you are reading this article right now, this is not the only site you browse. While you are online, probably you check your email, weather, stocks and a few news sites and the list keeps going on and on as you find cool sites everyday. It can be annoying to check all your favourite sites one by one and it’s time consuming too. Tariq Krim, the founder of Netvibes thought the same way and he came up with this brilliant idea to put all sites on one page so you don’t have to browse from site to site to obtain updated information. Of course, you can argue that Google and Yahoo did the same by offering personalized page … long time ago but Netvibes does things better and easier way than those big guys and the looks are a lot better than Yahoo and Google. Its no wonder 15,000 people visited on the first day of it’s launch in September, 2005 and more than five million users signed up. 60% users are from the US and there are users from more than 100 countries. 10 percent of users keep Netvibes page active throughout the day and use it as entry point into other sites. Netvibes offers ecosystem – made of pre-programmed modules which are made by users and you can put them on your own Netvibes page just with a click. Modules can be as different as news feeds, blog feeds, stock charts, weather reports and hundreds of different things. Lets say you added an RSS feed on your Netvibes page and you think it is cool and would be be useful to other users..you can publish this RSS feed on ecosystem with a click. Very simple and easy. I have created Netvibes modules for www.adawn.net and many other sites and some of them stopped working without any reasons. To keep my module active, I wanted to delete the inactive one but I could not find delete option anywhere. Finally, I had to create another module for www.adawn.net. Also, sites submitted in the beginning of October have not been verified yet by Netvibes team. A module is not available to other users until Netvibes team verifies it and if takes months to verify… its a sign that Netvibes needs to hire more people to keep up with heavy traffic. competitors are not napping in the meanwhile. Lots of other sites are popping up with similar concept and they have the financial and technological support to compete Netvibes. Webwag, Pageflakes, Protopage and many more are working at a tremendous pace to catch up with Netvibes. It would be interesting to see how Netvibes starts earning money. Investors already pouring in millions of dollars and Netvibes has not mentioned anything yet about how money can be generated. I would not be surprised to see the only exit point being sold to Yahoo or Google. Originally published on www.adawn.net. 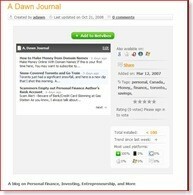 I am transferring all my articles from Canada’s Personal Finance Website. You will see articles from www.adawn.net being posted here once in a while. Thanks.